No mother likes it when her toddler starts crying, but at the held every year, at the Sensoji Temple, in Tokyo, the baby crying festival is a 400-year-old tradition, believed to keep rug-rats in good health. Wailing and crying as loudly as possible is not something most new mothers actively encourage in their babies. It may sound bizarre, but this is the competition at the Naki Sumo festival, held at the Sensoji Temple in Tokyo this year. 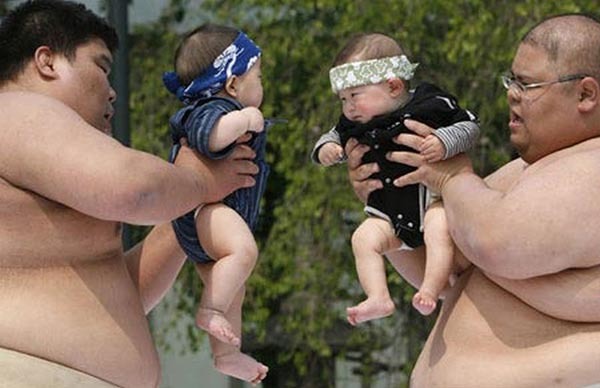 Amateur sumo wrestlers hold the babies high in the air, and try to scare them into crying, while a sumo referee judges the match. The toddler who cries longest and loudest is considered the winner. Sumo baby crying contest wailing is actually encouraged. 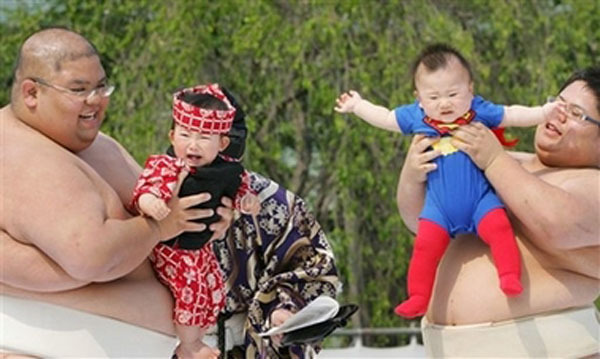 Japanese parents bring the babies to the contest, of their own free will, and truly believe the sumo induced crying keeps their children in good health, and wards off evil spirits. This year, 80 babies, all under one year old, participated in Sumo. As you might have guessed, the whiniest contender won. No physical pain is inflicted on the babies; the sumo wrestlers instead growl and scowl in order to get a wail. If both babies cry, whichever is loudest wins. Evil spirits: Japanese belief holds that the tears can ensure good health for the children. The babies are persuaded to tears by a sumo judge, who orders them to ‘nake, nake’ (‘cry, cry’) as the wrestlers growl and make faces. This entry was posted in Bizarre/Oddities, Cool, Featured and tagged Baby, Baby-cry, Contest, Crazy, Crying, Japanese, Sumo. Bookmark the permalink.